How Do You Know if You Have Shame? Shame is a very popular topic nowadays. Researcher Brene Brown has taken a very shameful topic like shame and turned it into normal dinner conversation. So what is it? Shame is that warm feeling that washes over you when you feel embarrassed or not good enough. It is the negative self-talk that tells you that you are a failure, worthless, and unlovable. It can be triggered by an embarrassing moment, someone speaking to you in a condescending or shaming way, or by your own insecurities. Shame can make you want to hide or be invisible to others. 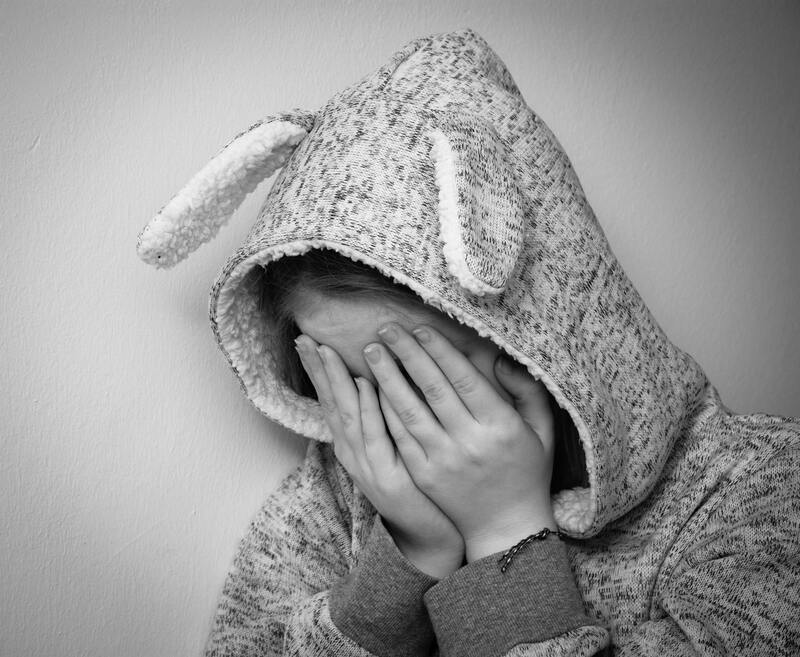 You may have a lot of shame if you were bullied or made fun of as a child. When someone bullies you, they send the message that there is something wrong with you—and then you internalize that and believe it is true. Maybe you were made fun of for your crooked teeth growing up, and as an adult feel a lot of shame over your smile. Maybe you were bullied for growing up in a poor family, and you have a lot of shame around money as an adult. Shame can also come from chronic embarrassment. For example, maybe you had a grandparent that always commented on your weight (gain or loss) when you were growing up. Every visit with that grandparent may have been difficult because you anticipated them making a comment in front of others. Chronic embarrassment again makes you feel that there is something wrong with you and that others are constantly judging you. Shame often comes from your family of origin. If you were raised with messages like “You’re stupid”, “You’re not as smart as your older sister”, “You are not good enough”, or “You are ugly”, you may have shame. These messages may have been verbally stated, or even just implied. When you are subjected to these type of messages, you are taught that you are a failure, stupid, and worthless—even if that’s not what your family actually meant. Messages like the above often create a negative self-talk in your own head as a child. You may compare yourself to others (and feel you don’t measure up). Maybe you never feel good enough, and feel like you always disappoint your parents. Shame can also come from feeling that you received the disapproval of someone you care about. If you are a constant disappointment to others, it must be your fault, right? This actually may be wrong. Sometimes our parents’ expectations are too high, and they put too much pressure and worth on achievements and performance. When your parents value academics, sports, image, etc. over your worth as a human being, you probably have shame. Those with shame often blame themselves for things that are not theirs to own or even out of their control. When your family invalidates your emotions, you are taught that your feelings are wrong. These messages may sound like “Get over it” or “You shouldn’t feel that way”. It could even be your family telling you what you are feeling, such as “You’re having so much fun”, even when you actually are feeling miserable. When your feelings aren’t validated as a child, you learn to not trust yourself. You push certain feelings out because you’re convinced they’re wrong or not real. Shame can make it hard to be sad, grieve, or even show anger in a healthy way. Some personalities are more prone to be shame-based. If you struggle with codependency, you may be more prone. Codependents believe that everyone else’s needs and wants are more important than their own. People who struggle to set boundaries with others may also have a lot of shame. Setting boundaries can be hard because it can create a lot of guilt, and feeling like you are letting other people down. It’s not unusual for shame-based individuals to avoid boundary setting because it makes them feel so uncomfortable. Those who are conflict avoidant may also struggle. To confront someone about something, it takes a lot of confidence. Those with shame would rather avoid and suffer than to possibly have someone else disagree with them. This dance often happens in marriages, where one spouse’s shame gets triggered and they shut down. Shame can come out in many ways. I’m going to discuss the most common behaviors that shame-based people exhibit. Some people who have shame may experience a lot of depression. If you have an interaction with someone who shames you, you may feel episodes of depression afterward. Sometimes comparing yourself to other people can also make you feel depressed. Many people who struggle with addictions have shame at their core. Being addicted to a substance actually masks the feelings of being a failure, feeling not good enough, and feeling inadequate. When an individual uses a substance, they can escape from their own thoughts and feelings, even if temporarily. It’s not unusual for those with shame to have perfectionism. Shame convinces us that we need to be perfect and portray a certain image. Even if you feel chaotic on the inside, it’s important to project to have it all together on the outside. Finally, it can come out as anger or rage. If someone feels inherently flawed or worthless, sometimes they direct their feelings of inadequacy at others. Very often, they shame others to compensate for how they feel. If you are reading this, and it resonates with you, please reach out for help! Shame can infiltrate all areas of life and impact your job, relationships, and your own self-worth. Brene Brown teaches that the antidote to shame is being vulnerable. This means that sharing your story and opening up to others destroys the secrecy that shame tries to create. When you share something shameful, and someone else says “Me too!”, it validates that you are not alone. To learn more about shame, click here to watch Brene Brown’s TED Talk on Shame.